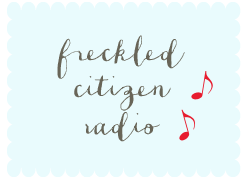 Is it just me, or was this a totally weird week? I'm ready to tune out for a while, personally. Let's go straight to my picks for the week, then, in hopes that it'll bring about the Friday-iest part of this Friday even sooner. Have a great weekend, folks! 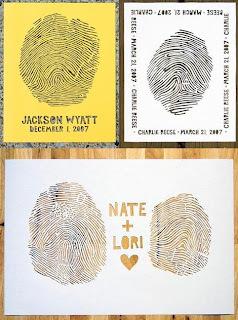 When I saw this papercut fingerprint art from artist Lori Danelle on Design*Sponge this week, I was totally blown away. Lori makes these papercuts directly from the fingerprints that you provide to her, and as you might imagine, that involves a lot of detailed work. 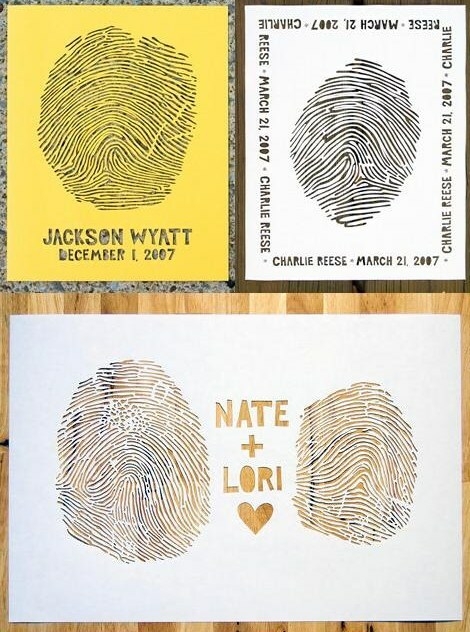 I honestly can't decide which I like better... the couple fingerprints or the baby fingerprint. Either would make an amazing addition to any wall. I'm fascinated by American wartime food posters. 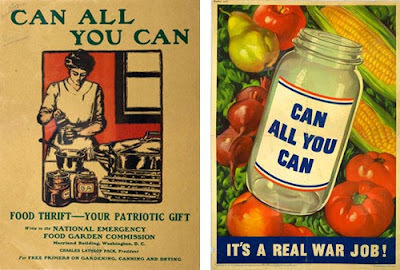 This online exhibit from the National Agricultural Library does a fantastic job of walking readers through the ways in which food consumption and production were marketed during wartime. Wouldn't these posters make the coolest collection? If you dig this, here's a smaller Smithsonian collection that features some of the same posters in closer detail, along with some additional ones. My college girls and I watched 'Dawsons Creek' religiously, mainly to roll our eyes at Dawson and root unconditionally for Pacey. This video is nothing if not a tribute to the irresistible charm of Joshua Jackson. And c'mon, can someone please produce a Pacey-all-growns-up show? "I don't wanna wait...!" My love for Joshua Jackson knows no bounds. I watch Fringe (which my dad calls "that interesting Sci-Fi show with Pacey in it") just to get a dose of JJ. 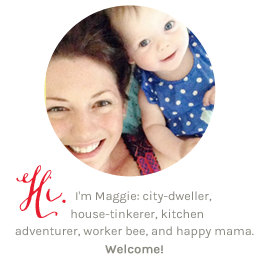 WR: I heart your dad! True Story: Upon the completion of our Senior Year Finals, before heading to Myrtle Beach for a week prior to graduation, 2 friends and I headed to Wilmington for the sole purpose of touring... wait for it... THE DAWSON'S CREEK SOUNDSTAGE. DC was already off the air and the WB had moved on to that One Tree Hill crap, but they still had all the props and many of the sets on the studio tour. There are photos of us climbing up Joey's ladder. Everyone else on the tour was under the age of 14 and was hoping to see Chad Michael Murray. It was awesome. Dawson's Creek began with the characters as sophomores in HS when I WAS a sophomore in HS. Obviously I found this to be highly significant and somehow felt I'd been given a blueprint for life. Ha! And I hated Dawson with his elongated, phallic-like head and terrible haircut. The hubs watches Fringe. I watched one episode with him in which I talked about Pacey the whole time. Needless to say, he now dvr's the show and watches it while I'm gone.